I’m not one to shy away from using a candy thermometer. But … I know sometimes you are. 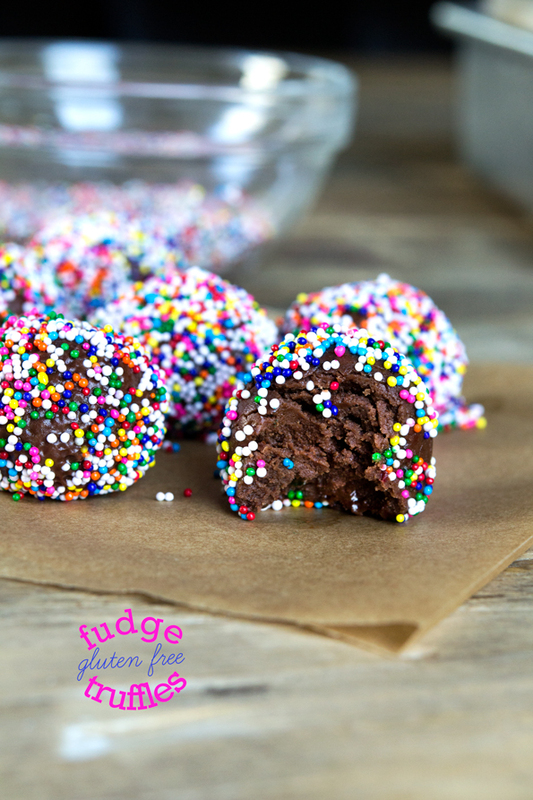 These fudge truffles are super super easy. No candy thermometer. When you have a second, though, could we talk about that candy thermometer thing? It’s so easy! But this time, you can leave it in the drawer. We’re making the easiest fudge around, and we’re making it into truffles. Now before you go and tell me that they’re not really truffles (like these gluten free cookie dough truffles aren’t really truffles), I would like to submit … that they kind of are. Traditionally, truffles are just little balls of chilled chocolate ganache. And chocolate ganache is really just melted chocolate mixed with heavy cream. These fudge truffles are almost, well, that. Except that you start by melting unsweetened chocolate with some butter, and then sweeten it and change its texture with confectioners’ sugar before adding (you guessed it) heavy cream. 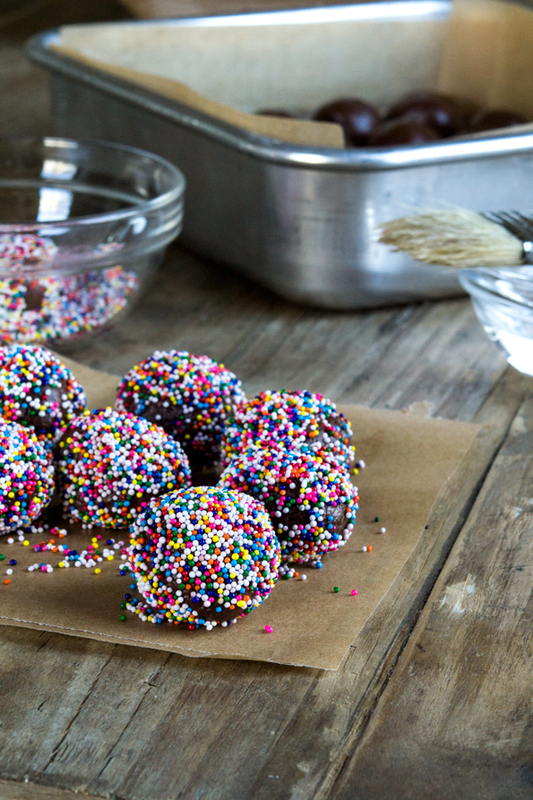 Now I coated my truffles in nonpareils because, you know. They’re just so adorable and festive. 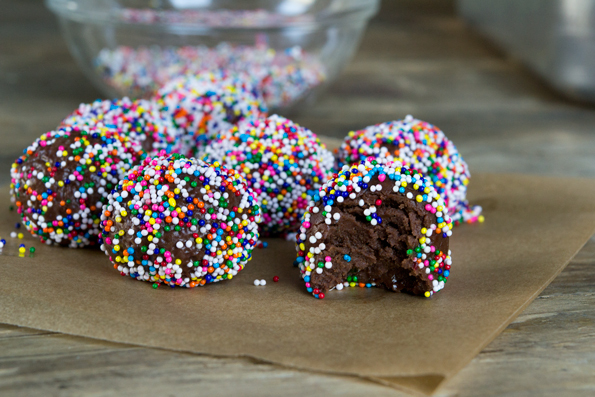 I have always found nonpareils in particular to be pretty much irresistible. I can resist sprinkles, if I must, but nonpareils? They wink at me. Those temptresses. If you’re 100% against all those food dyes (I’m not and that’s a fact), just … don’t use them. Use naturally-colored sprinkles if you like. Or just leave them naked. Or roll them in cocoa powder. Or chill the truffles, and then roll them in confectioners’ sugar. Looking for gluten-free information on nonpareils? Well, I’m happy to report that I just a moment ago this morning had a conversation with the nice folks at Signature Brands. They make both Cake Mate and Betty Crocker brand nonpareils, and all of their nonpareils are, indeed, gluten free. ‘Tis the season for some bright color, right? Or not. Either way. Place the butter and chocolate in a small, heat-safe bowl and melt over a small pan of simmering water, making sure the water does not touch the bowl. Stir occasionally until the chocolate and butter are melted and smooth. Remove the bowl from the heat, add the salt and vanilla, and mix to combine. Place 4 cups of the confectioners’ sugar in a large bowl, and pour the melted chocolate and butter mixture into the bowl slowly, mixing to combine. The mixture will eventually become crumbly, but will stick together when squeezed. Add the cream, and mix to combine. The mixture will be rather moist. Add the remaining confectioners’ sugar a tablespoon at a time, kneading the sugar into the fudge with your hands until the fudge is smooth. The fudge should be smooth and somewhat soft but not fragile. If it seems to fragile to hold together well, add more sugar and knead it in. Roll the fudge into balls about 1-inch in diameter, and place on a sheet of parchment paper at least 1 inch apart from one another. There should be about 30 balls of fudge. 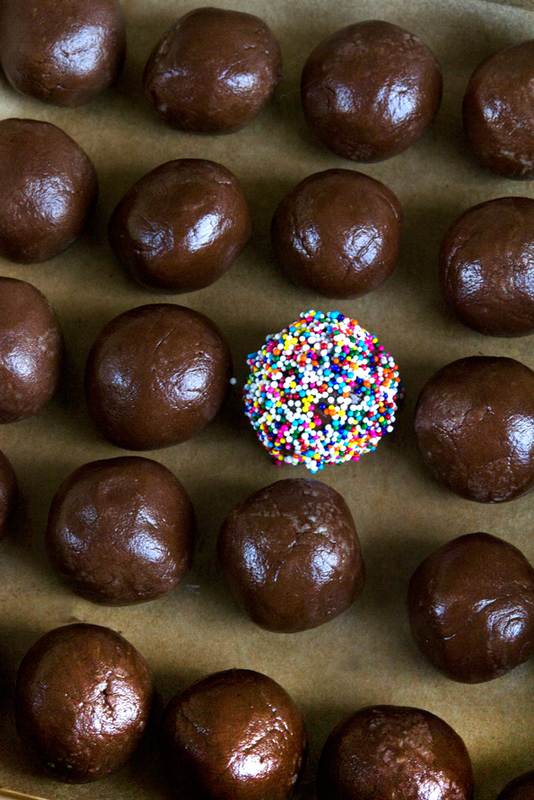 Brush each ball of fudge lightly with water, then roll in the optional nonpareils or sprinkles to coat. Place the truffles in the refrigerator to chill for at least 2 hours or until set. Serve chilled. P.S. I’m thinking about a live Q&A about gluten free bread next Tuesday, December 10, 2013, as that is the official publication date for Gluten-Free on a Shoestring Bakes Bread. Do you think that would be useful for you? I want to help easeeeeee you into making the best gluten free bread of your life! Made them, shared them and now they are all gone. Rave reviews all around. Convenient to make. Thank you for the great recipe! These rocked my world. I mean ROCKED MY WORLD. Seriously. I definitely vote yes for the Q&A next Tuesday! My Expandex arrived from Washington State about an hour ago so I’m ready to get rolling!!!! Since proofing baskets are listed as a “Want” in the new book, I’m wondering what everyone uses in place of them. Anyone care to share? I just use a bowl and plastic wrap. However, my best sized bowl just broke, so I am thinking the proofing buckets might be a better choice, looks like they take up less space, too. my GF sista – u rock!!!!! Do you think these could be made ahead and frozen? And how long would they keep if you can’t. Would you keep then in the fridge? Thx! Nicole….I’ve been searching your site for christmas cookie recipes…this is my first GF-Xmas. Thanks again for having such fantastic website…I’ve asked Santa for all your books for Xmas…. If you’re near Columbus, try shopping here in Dublin. Trader Joe’s, Whole Foods and an Asian supermarket are all within 1/4 mile of each other on Sawmill Road and 161. Target is here too for inexpensive Annie’s mac/cheese cups for the pantry! Thank you so much, DeblinKatie and Emma for jumping in here to help! dlfurl, I have not tried the Betty Crocker blend, no. From the label, it looks like it’s similar to my basic blend, which is just white rice flour, potato starch and tapioca starch. It has guar gum instead of xanthan gum, but that is fine. It is most likely not a superfine white rice flour, unfortunately, but for yeast breads with a long slow rise that shouldn’t matter much as the rice flour granules soften as the dough sits. That’s the best I can do for now, since I haven’t tried it yet, though! as an adult, I absolutely LOVE Annie’s mac and cheese. Put it in a baking dish, top with butter crumbs or any add-ins, and I guarantee no one will know it is gf! As a side note, once you get comfortable with it, online shopping really can save you a lot of time, money, and travel – you just have to look out for the deals! Thank you so so much for jumping in, Emma, and with such detailed information! That was so kind of you. I also vote yes for the Q&A! Are you doing it on Facebook? (You mentioned your Facebook page analytics below, so that is why I ask.) I already have a few questions and I have only just begun to peruse the book! Now as far as today’s confection is concerned — might have to be part of homemade gifts (to even gluten eating people)! Appointment is set in my calendar! Mmmm… these look really yummy. My GF kiddo cannot do un-baked dairy though, so I think I’ll wait to see how the science experiment without dairy turns out. Also, you can buy cans of coconut cream right next to coconut milk at my store. And I’ve used them to make whipped cream with great success. Yum! And, I would be very excited to have a Q&A! I have Lean Crusty White Sandwich Bread dough in the refrigerator as we speak… uh… write! Just mixed it up this morning and I am cautiously optimistic even though I was never very good at making bread with gluten in it. My mother is an extraordinary baker of bread and I’m sure the gene is inside me somewhere waiting to be awakened. My dough is sticky, smooth and stretchy as described in your book. And I tasted it and it actually tasted like bread and smelled like bread:) A wonderful yeasty smell. And since the oven was already on to help my starter rise atop the stove…. I decided to bake up a batch of GF chocolate chip cookies. My little GF girl doesn’t seem to mind at all! I want to thank you for this recipe. It is so simple and not all fat laden and stuff. can’t wait to make it! Thanks for the tip! I was thinking of leaving it in the refrigerator for a couple days to ensure it had enough time to rise. Good to know that will make it easier to shape, too. I’m thinking of starting another recipe rising tomorrow. Just need to stop for the dairy ingredients for the soft hot dog rolls. Thank goodness my daughter recently passed her food challenge for baked-in milk! holy moly – these are so yummy looking. And yes, I will also be making candies for the holidays so these are going on ‘the list’. Yahoo! I also vote yes, yes, and one more yes for the Q&A! I know your list is literal, Jennifer, not metaphorical! And I will look for your smiling … avatar on the Q&A, then! For scientific purposes, I will try to make these dairy-free this weekend and report back. But only for science. I vote yay for the Q&A! It’s the right thing to do, Donia. And for the record, here are my untested dairy-free suggestions: for butter, shortening (nondairy butter sub will be very very soft); for heavy cream, full fat coconut milk (with very little of the liquid so it’s mostly fat, like heavy cream). Glad you’re into the Q&A! if you made coconut cream with a can of full fat coconut milk in the fridge that will give you more solids too. Just a thought. Oh yes, I pretty much always have a can of coconut milk in my fridge. If the need for a dessert arises swiftly, one must be prepared! You can also just get cans of coconut cream now. I have a few in my pantry. Ah, I’ve seen those at Trader Joe’s. I will have to buy some. Thanks! thank you thank you thank you! I was going to ask for suggestions on how to make these dairy free :) Boyfriend and I thought the AMA on reddit was a terrific idea, too. We are religious reddit followers. Now, see, I may not be a big fan of cookies, but I have no trouble using a candy thermometer. Or food dye. Or calling a non-truffle a truffle. Unfortunately, I do have this kid with her jaw wired shut, so making truffles seems really unfair. Truffle flavored milkshake? I like the idea of a live Q&A, and seems like a great way to mark the publication date of the fabulous bread book! I have pictures of my muffin bread and my levain rolls, I’ll try to post them later. Anneke, three words for you: chocolate cake shake. A specialty in these here parts (I guess). Make a perfectly good chocolate milk shake. Throw a piece of chocolate cake in it and blend it some more. I’m pretty sure the other kids will be jealous of her! omg – you’re killing me! Chocolate Cake Shake!?! This has potential! Much better then the dietician suggestion of Cream of Wheat! just printed out those fudge truffles- even frozen they won’t last very long in my house. I used to make them b/4 the gf days with rum or brandy or strong coffee instead of vanilla; or when desperate just the flavorings. I gotta make these this weekend! Thanks Nicole you are doing a great job! you need a new dietician! Cream of WHEAT? I personally wouldn’t even touch Cream of Rice from the same company! OMG! So glad you like the live Q&A. I was thinking of doing it at 8:30 pm EST, as my Facebook page analytics indicate that that is a peak time most days. I will keep you posted! chocolate cake shakes? holy moly! Not mine, Chicago’s. Most notably, by a chain called Portillo’s. They literally just take a piece of their chocolate cake (with frosting), and throw it right in there. Yes, I’ve had it in our pre-GFDF days. And yes, it is as good as you would imagine. I saw on Diners Drive-ins & Dives that a place does an apple pie shake – same concept – chop it up and throw it in the milkshake. Yum to both! We do that with Pumpkin Pie. They are awesome!